Situated on top of an eroding terrain of volcanic rock and overlooking the Tiber River Valley, is the town of Civita Di Bagnoregio. When exploring the Tuscia region, you should not miss the town of Civita Di Bagnoregio. The town has a rich history dating back to the Etruscans nearly 2500 years ago. 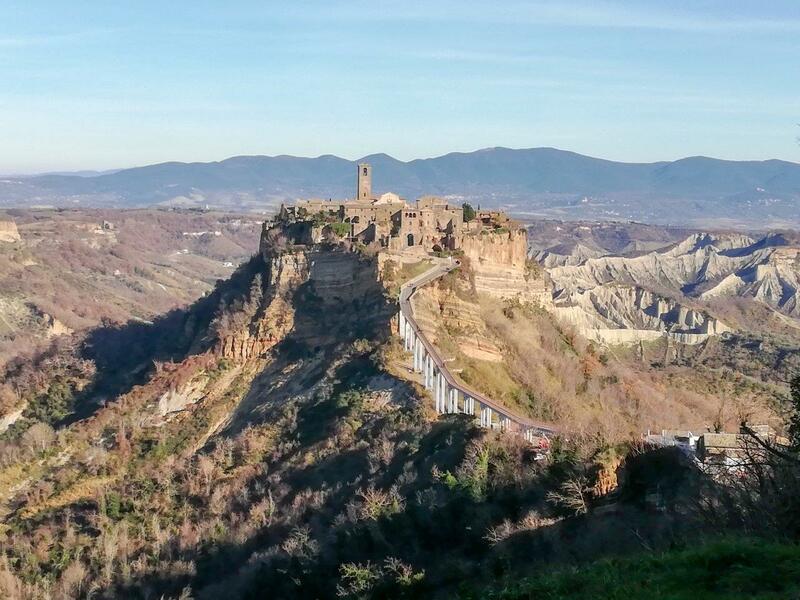 Most notably, Civita Di Bagnoregio is the birthplace of Saint Bonaventure. The town has been nicknamed “the floating city,” due to the fact that it balances tall and proud on top of a volcanic mountain. The only access point is by a pedestrian bridge. I was lucky enough to explore this whimsical town earlier this year and, let me tell you, it is stunning! Only about 7 people live in the town. It is truly a hidden wonder. Everywhere you look there is history, from some of the oldest buildings I have ever seen to the graves hollowed out in the side of the mountain. The best part of Civita Di Bagnoregio has to be the breathtaking and unique view. My favourite spot to take in this sight is a private “secret garden,” lovingly maintained by one of the local townsfolk. For only a small coin donation, you can step into a weird and wacky hand-crafted garden whose charm arises from the strange and unusual landscaping and installations including women’s handbags sprouting various species of plants. From inside the garden, one is mesmerized by this patch of greenery in an otherwise cobblestoned town. From the top of the garden, accessed by stairs, you have the highest viewpoint overlooking the valley. The valley is wonderful; lush greenery, rivers and old houses all spread out beneath you in Civita Di Bagnoregio, creating a sight that is unlike anything you are likely to have seen before. I highly recommend shelling out a coin to take in this view from the garden, if for no other reason than to make the local gardener’s day. He is very proud of his garden. While in town, there are many restaurants and shops selling fresh local food and wine. So why not sip a nice red wine while overlooking the magnificent view, or dine on authentic pizza or pasta? Unfortunately, the borders of this town are slowly but surely eroding with age, making Civita Di Bagnoregio a must see before it’s too late. Many houses have already been lost, such as the childhood home of Saint Bonaventure. If you are in the Tuscia region, or exploring Rome, please do yourself a favour and drink in the beauty of this unique town. 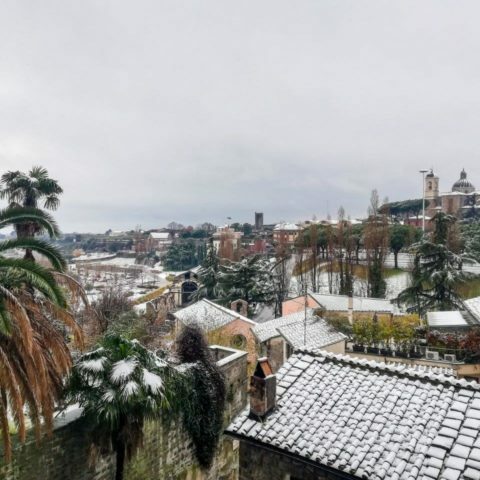 If you need some help getting to Civita Di Bagnoregio, or would love to learn all about the town’s rich history, do not hesitate to contact inTuscia.